HITCHCOCK, Texas (CNS) — Ten candles. Ten white roses. Ten lives lost. Just two weeks days after the violent shooting shattered the small-town communities near Santa Fe High School, Our Lady of Lourdes Catholic Church, located six miles from the high school in Hitchcock, hosted a May 30 memorial vigil and prayer service for the 10 victims of the shooting. 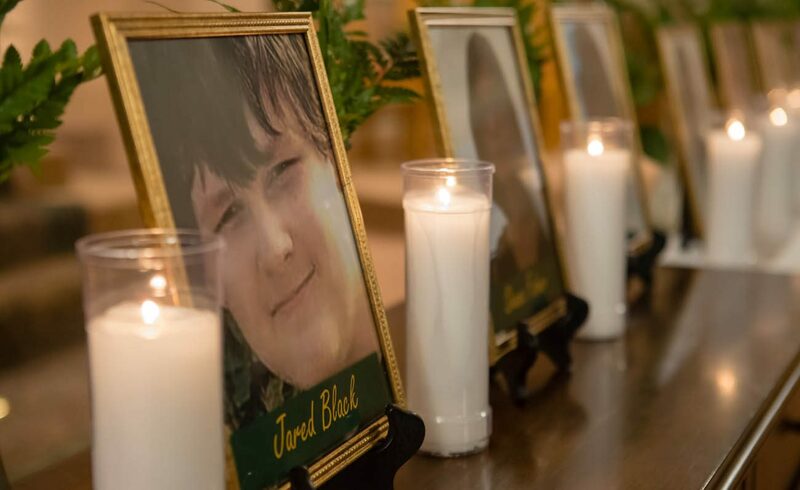 At least 300 parishioners, friends, family, visitors and survivors of the shooting gathered in the church to remember those who died May 18, including eight high school students, aged 14 to 17, and two beloved Santa Fe school teachers. One by one, as Father John Kappe, pastor of Our Lady of Lourdes, read the names of each of the victims, 10 teens — several wearing green “Santa Fe Strong” shirts — slowly walked down the aisle, each carrying high a candle in memory of one victim. They then placed their candle next to a victim’s portrait and a white rose, several visibly emotional. At the sound of each name, a bell tolled loudly, echoing throughout the church. Father Kappe encouraged the attendees, offering words of solace and hope. “The truth is that up until almost two weeks ago, no one in this church this evening planned to be here. Our plans and our schedules at this time were vastly different. We were all going to be somewhere else,” he said. The shooting shocked communities still in recovery from Hurricane Harvey, the parish itself having recently renovated after seeing Harvey’s floodwater fill the sanctuary. Many of those affected, students, parents and community members, were flood victims themselves. “We need to focus on the memories and the good times at Santa Fe High School that made you happy,” said Father Kappe, “and helped you to enjoy being in high school: the football game, the prom, the pep rally, the common bonds of friendship, and all of the other high school memories that have made you who you are. Those in attendance included shooting survivors and family members, members of the school staff and administration, as well as youth ministers and clergy from nearby parishes who helped minister to the community at the hospital or in parishes. Outside the church, 10 green crosses surrounded a larger wooden cross, each bearing the name of a shooting victim. Inside, uniformed officers stood watch in the narthex of the church and offered a visible presence. According to May 30 reports from the Santa Fe Police Department, Officer John Barnes, with the Santa Fe Independent School District, is still hospitalized and remains in critical condition. Wounded by a shotgun blast while confronting accused shooter 17-year-old Dimitrios Pagourtzis, hospital officials said Barnes flat-lined twice. He and a fellow officer are recognized for drawing Pagourtzis away from other students. On May 23, Houston Mayor Sylvester Turner named retired Archbishop Joseph A. Fiorenza of Galveston-Houston to his commission against gun violence, with 36 others from a cross-section of the city community. Following the 2016 Orlando Pulse nightclub shooting, Archbishop Fiorenza spoke at a vigil at Houston’s City Hall, calling for change and to protect and pray for all walks of life. In closing his reflection, Father Kappe shared a call to love and forgive.